The wedding is over and people are asking where best deals and service were found. Specifically, I'm being asked about the wedding punch bowl that I ordered off of eBay and other wedding items and the gown. When possible, we gave priority to Knoxville area companies. Please know that I can only write about our experience. Whether good or bad, your experience with a particular product or company can be different than mine. Also, if I miss something about the wedding that you want to see written about, then contact me and I'll try to cover it. Several receptions are coming in the future so I feel that investing in quality pieces now is an investment. One of the best deals we got was a wedding punch bowl that I ordered off of eBay from southernflair255. The brand new hammered metal punch bowl looks great on a reception table. It is fairly lightweight, stands about 8” high and is about 12” across. The sides have a smooth fleur de lis pattern against the hammered background. It has a weighted bottom that prevented tipping. 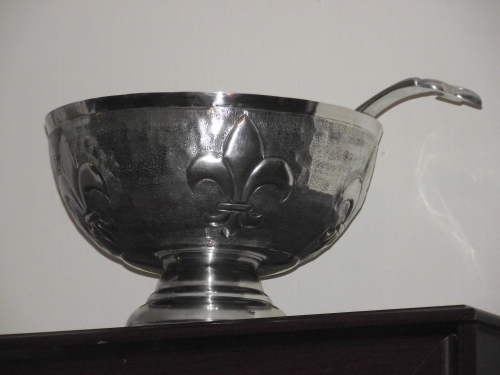 The ladle is made of heavy duty metal and holds about ¾ of a cup of liquid. It has a snappy fleur de lis on the end and spouts on both sides. Filling punch cups for our wedding guests was almost spill proof. At $79 the price would have been reasonable for the wedding punchbowl itself. However; free shipping and a free ladle made it one of the best wedding deals that we purchased. I ordered the set right before Memorial Day weekend. I was told of the shipment when the seller left feedback for me. The seller uses expedited shipping so the punch bowl set arrived in time for the wedding. Our guests enjoyed it almost as much as they did our faux champagne.